What Does Adventure Golf Mean to You? This week we asked our Adventure Golf manager, Jack “What does Dinosaur Safari Adventure Golf means to you?” and “Why is it such a great day out?” Before we hear what he has to say, here’s a bit of background on Jack. Jack started working at one of the other Adventure Experience sites, Dinosaur Escape, in Northolt in 2015. Jack was at Dinosaur Escape for just under 2 years however transferred to Dinosaur Safari Adventure Golf last July just before the summer holidays. Jack has great experience in ensuring that everyone that visits our Adventure Golf course has a fantastic time, enough for them to want to come back & he really makes that his key focus. So Jack, what does Adventure Golf mean to you? Why is Dinosaur Safari Adventure Golf such a good day out? The fact that it is called adventure golf is one of the reasons it is such a good day out, it quite literally is an adventure, especially here at Dinosaur Safari. With our towering dinosaurs & the large plant growth it does really feel like you transported to an exotic safari adventure, you’d never believe you are just outside of London! We also have a fantastic team that is always happy to see you and are willing to go above and beyond to ensure that you have the best possible day. After you’ve finished putting away, we have a great place to sit back, relax and rest your winning hands with our decked area with free picnic benches and a stunning view of some of the course. Whilst sitting and enjoying an ice cream or one of our delicious Polar Krush Slushes, you can take a peak over at the driving range on site. There’s something peculiarly interesting about watching golf in the sun; with an ice cream and your legs up, I can’t think of anything more brilliant! 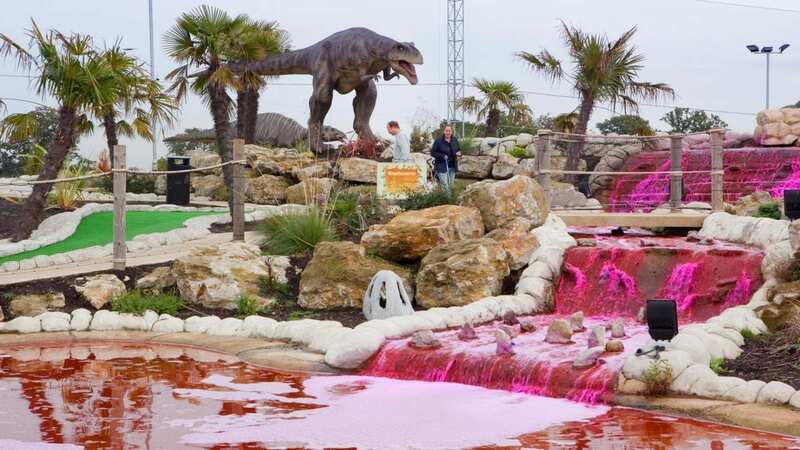 Not only do we have a fantastic 18 hole adventure golf course surrounded by our incredible Dinosaurs but like we mentioned there’s also a 55 bay driving range. If you’ve played here at Dinosaur Safari Adventure Golf, the range offers a special price for kids looking to get into golf – you get 25 balls with a club hire for only £2! There is also the A1 Golf Café if you’re looking for a bite to eat, as well as an American golf store if you want to get kitted up in the latest golfing gear. Even though we are separate from the other things to do on site, our team will be able to offer the latest information on everything the site offers so feel free to ask. If you’ve been and visited us here at Dinosaur Safari Adventure Golf please tell us how your visit was on Trip Advisor or Facebook. We are committed to giving the best service and maintaining the course to a really high standard, so if there was anything that you noticed on your visit please let us know so we can make sure that the issue gets resolved.